Acoustic live music in Haverhill since 1988! Meeting Across the Water (‘MATW’) concerts are a joyful cross-fertilization of diverse musical influences dancing with each other and making something at once old and new. 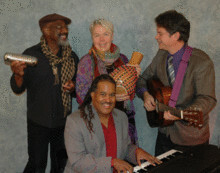 Each of the four members: Fred Griffeth, Louise Grasmere, Jonathan Singleton, and Eric Kilburn are accomplished, multi-talented musicians with decades-long active participation in the Boston music scene. Fred Griffeth has been a professional singer for over 60 years, and was in a doo-wop group The Jaguars in the 1950’s that had a charting hit song. Later his band The Mandrell Singers toured with the top acts of the day including Dave Van Ronk, Odetta, Richie Havens, and The Clancy Brothers. His band The Bagatelles shared a stage with Little Richard in Detroit, during the 1968 Democratic Convention. Louise Grasmere is a prominent member of Boston’s blues and jazz community, a legendary vocalist, percussionist and longtime acolyte of the great African drummer Babatunde Olatunji. Jonathan Singleton is a widely-respected jazz and gospel pianist and conductor/arranger, Berklee assistant professor, and choir director at the Twelfth Baptist Church in Roxbury, the church where Martin Luther King Jr. served as an assistant minister while pursuing doctoral studies in theology at Boston University in the 1950’s. Eric Kilburn is a well-known singer-songwriter. He performed throughout the Eastern United States during the 1980’s and 1990’s, both as a headliner and opening for Tracy Chapman, Shawn Colvin, Eric Andersen and other well-known folk musicians. Eric’s songs have been covered by Arlo Guthrie, Fed Small, Lui Collins and many others. Eric has also engineered over 800 albums at his Acton, MA recording studio, Wellspring Sound. MATW members bring songs to the group that have inspired them in some one or more ways. Many of the songs have singable choruses, many of the songs speak to the nature of faith, and some of the songs explore America’s 400 year conversation about race. In addition, many songs find their way into a set because they are just fun to sing. Sometimes a song will have each group member sing a verse, with multi-layered harmonies on the choruses. Accompanying the vocals are various keyboard sounds, guitars, mandoliin, mandocello, and all manner of percussion. Meeting Across The Water (‘MATW’) formed in 2011, when four members of the Mystic Chorale, a community chorus based in Arlington, MA, were inspired to combine their talents and explore Black and White gospel and roots traditions in new and fun ways. The vast wealth and diversity of America’s faith-based musical heritage brings forth the talents and inspiration of each musician. Every MATW performance is a one-of-a-kind, fully immersive experience, lifting up and bringing together audiences of all ages, backgrounds, and walks of life. A Meeting Across The Water concert is a joyous, raucous affair, with great interplay between the band and the audience. The band brings a relaxed command of diverse styles combined with an abiding love of the music, and audiences are left fulfilled and inspired.